A form named after the professionals of the Italian Friuli, Marco Simonit and Pierpaolo Sirch pruning, The method developed in the 1980s is not fundamentally new, but is based on very old habits adapted to the requirements of modern viticulture. In the foreground is the health of the vine with extension of the life cycle to at least 50 years, that is to twice the today's average age. Thus, the philosophy of high quality, which in part is already regarded as obsolete, is gaining old vines again important. 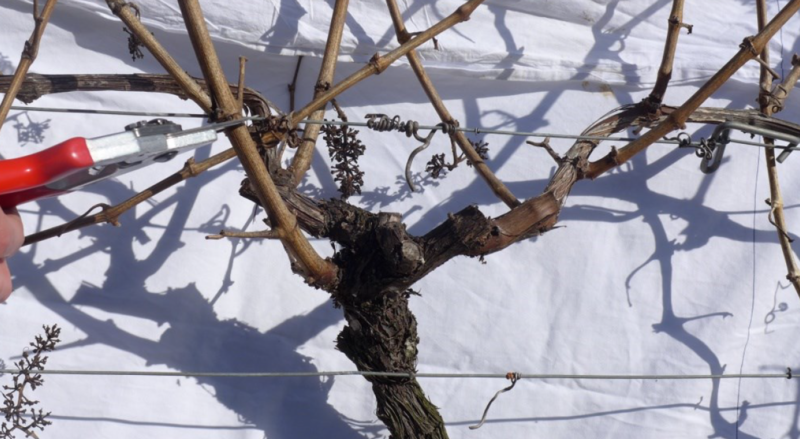 According to Simonit and Sirch, the longevity of a vine depends above all on a correct pruning that does not damage the vital parts. The typical Mediterranean Albarello bush form ( gobelet ) is a special guarantee for longevity, which allows a cut mainly on young wood. A cut on old wood, however, leaves a wound from three years, which damages the vessels of the plant. The penetration of wood fungi is relieved and are the cause of wood diseases such as Esca or eutypa dieback, The method is to always proceed on young wood with careful cuts. In concrete terms, this means cutting only one to a maximum of two years old timber and thereby cutting the newly cut one shoot always at the base of the spigot of the previous year. At the same time a pin is cut on the opposite side of the trunk head. Spigots and cut rods thus have a connection to already developed Xylem and are always on the same vegetation cone, which forms over the years with the growth in thickness, a branch-shaped continuation of the Rebstammes. The picture becomes one Riesling floor shown before the cut. The plant was first cut in the previous year using the new method; The two new exits are recognizable (source and image rights: Dr. Matthias Petgen, DLR Rheinpfalz). This page was last modified at 19 October 2017 at 20:17.